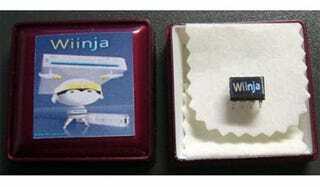 The console scene group Ninja plans to release the Wiinja, the world's first Nintendo Wii modchip, by February 1. With the chip installed, which only requires you to solder five wires, you'll be able to play backup copies of Wii games on your console. (Downloadable Wii ISOs already litter the Internet.) One reason why we believe that this could be the Real Deal is that Ninja already makes shady accessories for the Nintendo DS. Should the Wiinja actually come out, it'd make the Wii the second of the three next-gen systems able to play backup games, after the Xbox 360. We eagerly await a review unit. For purely fair use backup purposes, of course.